Exceptional golf and the good life are the main attractions at Colleton River Plantation Club, one of the Lowcountry’s premier golf communities in Bluffton, South Carolina. Looking out on the Colleton River and Chechessee River from a peninsula known as Colleton Neck, its residents enjoy some of the most beautiful views in the area. 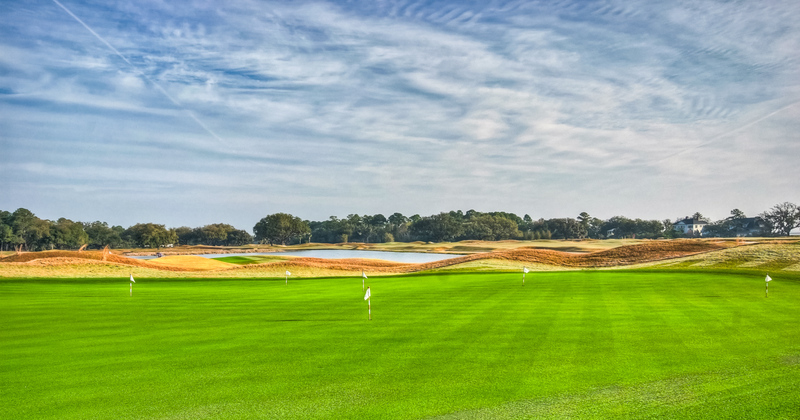 Two world-class golf courses, one designed by Jack Nicklaus and the other by Pete Dye, have earned Colleton River Plantation Club multiple accolades over the years as one of the finest private golf communities in the United States. If golf is a high priority in your life and you are in the market for a luxurious home in a private community, Colleton River Plantation Club is a good place to begin looking. Covering approximately 1,500 acres it composes one of the finest examples of a private residential community designed to embrace the land’s natural beauty. Roads lined with moss draped live oaks and palmetto trees wind throughout the property past magnificent homes built to blend with the landscape and sweeping views of the rivers and out to Port Royal Sound and the Atlantic Ocean. Residents enjoy Colleton River Plantation Club’s award winning Jack Nicklaus and Pete Dye championship golf courses, a lively residential club social life and access to the water. It is Bluffton’s only private community surrounded by water with deep-water access, putting its deep-water lots within minutes of the Atlantic Ocean by boat. Colleton River Plantation Club is unquestionably an upscale private community. Its diverse collection of custom homes range from 2,800 square foot ranch style bungalows to grand, opulent estate homes up to 8,000 square feet and more…much more in some cases. Colleton River Plantation Club does have an architectural review board to maintain aesthetic standards, but it does so with more flexibility than in other private communities. Some of the styles you’ll see throughout the community include Lowcountry, French Country, Tuscan, Plantation, Contemporary and Cottage. Homes for sale in Colleton River Plantation Club will range in price from about $400,000 to over $12 million and undeveloped lots for sale are available for $10,000 to over $1 million. The average lot size is about one half acre, but some estate-sized lots are up to six acres and greater. Colleton River Plantation Club is purely a residential community with no short-term rentals permitted except for nine member-owned golf cottages. These are for the exclusive use of Colleton River Plantation Club members and guests. Colleton River Plantation Club’s main entrance is about two miles from the bridge to Hilton Head Island, placing it conveniently to all of the recreational activities, shopping, dining and services on the Island as well as throughout greater Bluffton. The Borland nine-hole Par 3 course is where Colleton River Plantation Club golfers like to work on the short game or get their newbie children and grandchildren into the game. It has been compared to Augusta National’s Par 3 course. Colleton River Plantation Club has two clubhouses, one at each golf course.Both offer fine dining for lunch and dinner and also serve as meeting places for social events and the residents’ many lifestyle interest groups and clubs. Although golf is the heart of Colleton River Plantation Club’s amenities package, other sports and recreational activities are well served too including the Stan Smith Tennis Center, a 6,000 square foot Fitness Center and Spa, a Jr. Olympic sized pool and kiddie pool, a Community Dock with a gazebo and outdoor deck, and miles of leisure trails. Colleton River Plantation Club is an exclusively residential private community far removed from the resort lifestyle when you’re behind the gate, but minutes away from Hilton Head Island’s beaches and other offerings when you want them. Most residents fall into the empty nest or pre-empty nest life stage, but a trend of younger homebuyers are finding their way to the community. If world-class golf and upscale club living is for you, Colleton River Plantation Club is for you too.